The Deodar cedar (Cedrus deodara) is an evergreen conifer tree that is favored for its weeping habit. It is often used as a specimen tree in parks and other large gardens and can also be used to line streets. This species is the national tree in Pakistan, and it has garnered the Award of Garden Merit from the Royal Horticultural Society. Each needle on this conifer is 1 to 2 inches long and can be bluish-green or grayish-green depending on the cultivar. They are produced in whorls of 20 to 30 needles. They also appear individually on long shoots. This tree is classified as Cedrus deodara and is one of the real cedars. Other true cedars include the cedar of Lebanon (Cedrus libani) and the Atlas cedar (Cedrus atlantica), which comes in a weeping form. It is in the Pinaceae family which includes both evergreen and deciduous conifers like pine trees, spruce trees, and fir trees. This species is known as the Deodar cedar, deodar, and the Himalayan cedar. The name deodar evolved from the word devadāru, which is a Sanskrit word that translates to "timber of the gods." This tree is sacred in Hinduism. Deodar cedar trees, which can be propagated from seed, need plenty of space, a sunny spot, and slightly acidic, well-drained soil. They grow at a moderate pace, adding 1 to 2 feet per year to reach between 40 and feet tall, though it can reach 150 feet in its native area. The tree needs all that space because of its beautiful weeping branches, which will grow and spread. Avoid planting the tree in areas that get a lot of wind. Plant a deodar cedar sapling in the early spring months, right after the ground has thawed, or in the fall once the plant has gone dormant in preparation for winter. If you plant the tree in the fall, it won't need as much sun or water as it would in the spring. When planting, dig a hole that's at least three times as wide as the tree's root ball. Add 25 percent compost, peat, or aged manure to the soil to help it drain, put the root ball in the hole, and return the soil and organic mix to surround the tree. Tamp the soil lightly, and water it thoroughly. A planting site with full sun is best for this evergreen tree, though it can tolerate partial shade. Deodar cedar trees can be grown in a wide variety of soil types, including loam, sand, and clay, as long as that soil is well-drained. GIve the tree plenty of water during the first few growing seasons. Once established, deodar cedars are somewhat drought-resistant. Check to make sure that your soil offers good drainage because this species likes moist soil but cannot tolerate wet feet. Of all the cedar trees, the deodar cedar has the best tolerance for heat and humidity. Fertilize the ground around the tree in the spring months before new growth begins. Don't fertilize the cedar more than once per year, as too much nitrogen can cause root burn. 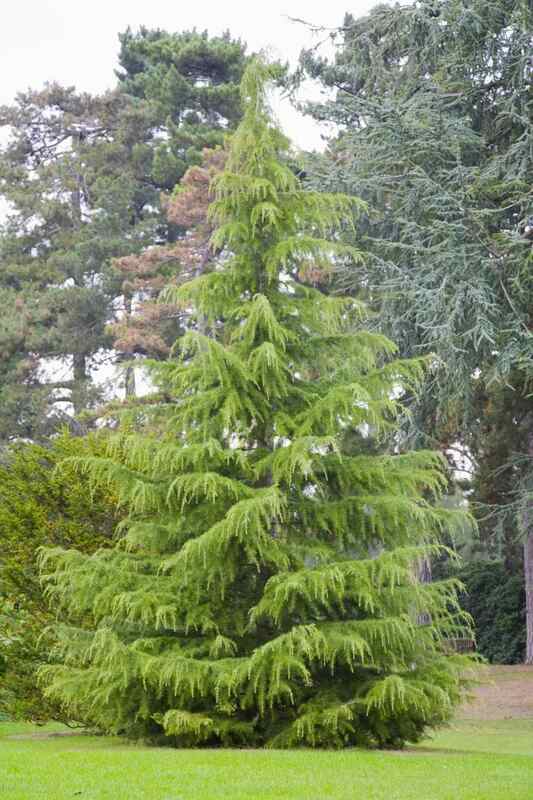 Deodar cedar is a low-maintenance tree. The only pruning that is usually needed is to remove any branches that have become dead, damaged or diseased before new growth begins in the spring. If you need to prune, take extreme care—it's easy to cut away too much green that won't grow back, which could lead to the tree's death. Giant conifer aphids are known to attack the deodar cedar, though these infestations do not usually affect the tree enough to severely injure it. They do, however, produce a sticky liquid called honeydew which can fall to the ground and make everything tacky. To manage these aphids, spray with high-pressure water to remove the pests, and then use an insecticidal soap. In the spring, apply a systemic insecticide. Honey fungus (a parasitic mushroom) may develop on this tree, but it can be controlled by burying a physical barrier, such as a heavy-duty plastic sheet, in the soil. It can't be controlled with chemicals. Root rot may occur if the soil is soggy, so ensure that it's planted in a soil that drains well. There may also be spots with sooty mold if honeydew is present from aphids.